The same year the delegations of librarians paid reciprocal visits to the U.S. and U.S.S.R., the Special Library Association (SLA) submitted a proposal to the U.S. Department of State for the exchange of special librarians in the third cultural exchange agreement. For unknown reasons, it was rejected by the Soviets. However, the leaders at the American Library Association and SLA remained firm in their belief that there was “a desire on both sides to understand each other and to find common, fruitful grounds for the development of personal and professional mutual interests in the years ahead” (Ruggles and Swank 1962, 6). However true this may be, the 1961 exchange was the last occurrence of reciprocal librarian visits under official diplomatic agreements. 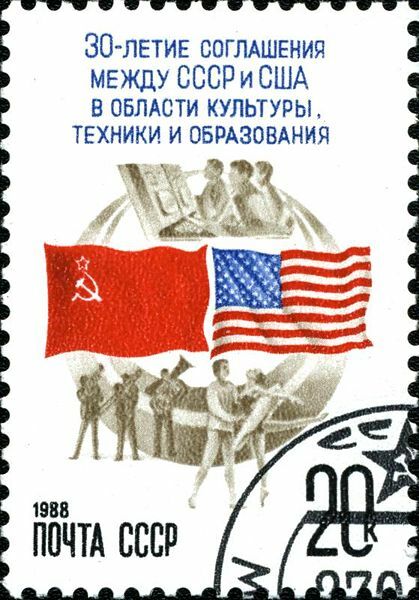 A 1988 Soviet postage stamp commemorating 30 years of cultural exchanges between the U.S.S.R. and the United States. Even as early as the first two years of the cultural exchange agreement, many believed that the exchanges indicated progress in the attainment of peace between the two nations, but only of a limited sort (Coriden 1958, 68; “Cultural Exchanges” 1958, 20; Schwartz 1958, E5). 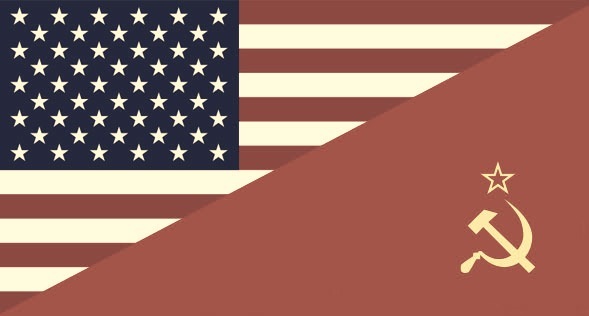 Despite the constantly shifting tension between the U.S. and the Soviet Union, the cultural exchanges remained a consistent theme in American-Soviet diplomacy until the end of the Cold War in 1991. In the 33 years of cultural exchanges, thousands of Soviet students, scholars, athletes, artists, tourists, scientists, and professionals would travel to the United States, and even more Americans would go to the Soviet Union. In trying to determine the impact of cultural exchanges in general, there is no simple answer. It seems evident that scholarly exchanges helped to broaden and deepen the outlook of academics and students on both sides (Barghoorn 1967, 118). Some historians even theorize that the collapse of the U.S.S.R. was caused by contacts and exchanges with the West, particularly those with the United States, and that the cultural exchange agreements between the two countries led to an increase in Western influence among the Russian people (Richmond 2003, xiv; Hixson 1997, 227). The impact of the librarian exchange like those of other early cultural exchanges, is difficult to determine, but at the very least, it did seem to lead to an establishment of relationships and an opening of communication between some American and Soviet librarians. One thing is clear, the exchange of American and Soviet librarians in 1961 served as one of the “thousands of methods by which people can gradually learn a little bit more of each other” of which Eisenhower had dreamed.